"Vom DM-Nationalismus zum Euro-Patriotismus? - eine Replik auf Jürgen Habermas"
"In seiner Rezension meines Buches „Gekaufte Zeit“ diagnostiziert Jürgen Habermas bei mir „nostalgische“ Gefühle für den guten alten Nationalstaat. Eigentlich hätte klar erkannt werden können, dass es mir nicht um den Nationalstaat als solchen geht, sondern um die demokratischen Institutionen, die er, und immer noch nur er, allen postdemokratischen Bemühungen zum Trotz denjenigen zur Verfügung stellt, die sich dem supranational organisierten Vormarsch des Neoliberalismus entgegenstellen wollen. Warum das eine „nostalgische Option“ sein soll, entzieht sich meinem Verständnis." "Die Währungsunion erscheint ... als ein Programm zur Zwangs-vereinheitlichung der Wirtschafts- und Lebensweisen der europäischen Völker, das diese gegeneinander aufbringt und sie politisch in Nationalstaaten erster und zweiter Klasse auseinanderdividiert. In ihr kulminiert die europäische Variante der neoliberalen Immunisierung expandierender kapitalistischer Märkte gegen egalitär-interventionistische demokratische Politik, wie sie nach dem Ende der Nachkriegsordnung des demokratischen Kapitalismus zu einem weltweit dominierenden Trend geworden ist." "Was Habermas und anderen vorschwebt, die auf eine Lösung der europäischen Krise durch eine europäische demokratische Wende hoffen, wäre nichts Geringeres als ein neuer europäischer Gründungsakt, eine Neugründung mehr oder weniger ab ovo, damit ein Sprung aus der Geschichte der letzten drei Jahrzehnte, der die in Europa gewachsenen supranationalen Institutionen durch revolutionären Beschluss innerhalb derselben fundamental umkrempeln würde – als ob das, was ist und geworden ist, nicht machtvoll mitreden würde, wenn es darum geht, was in Zukunft aus ihm werden soll." "Auch eine noch so demokratische supranational-europäische Demokratie wäre [....] wertlos, wenn das Verhältnis zwischen ihren Institutionen und den Märkten, insbesondere den Finanz- und Arbeitsmärkten, zwischen Politik und Wirtschaft, zwischen Demokratie und Kapitalismus so bliebe, wie es in den letzten Jahrzehnten geworden ist." In "Die Zeit" (August 29, 2013), Thomas Assheuer writes about the debate between Habermas and Streeck. (Not yet available online). See also my blog post on Assheuer's article from May 2013: "Das böse Spiel". 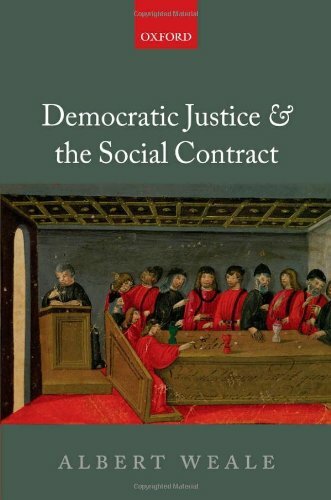 New book: "Democratic Justice and the Social Contract"
This book offers a theory of democratic justice. According to the theory, justice emerges from collective agreement among political associates who enjoy approximate equality of power. Such situations can be seen as social contracts, and we find an empirical model for social contracts in the examples of successful common property resource regimes. In these regimes, participants craft collective rules of access to the means of production on an equal basis and producers are entitled to the full fruits of their labour. To interpret this theoretically an account of practical rationality in terms of individual and public deliberation is required. In tracing the move from small scale to large scale societies, three important transformations become apparent: in political institutions; in the economy; and in the functions of the household. All are relevant to the understanding of justice. In great societies representative parties making policy and law in shifting coalitions in parliaments elected by proportional representation exemplify political equality and so instance one form of democratic justice. In the economy corporate hierarchies modify the full fruits principles, not always in the direction of justice. Redistribution is justified as a means of smoothing income across the life-cycle, rather than by appeal to economies of scale or a simple principle of need. Albert Weale is Professor of Political Theory and Public Policy in the School of Public Policy, University College London. He is the author of "Democratic Citizenship and the European Union" (Manchester University Press, 2005) and "Democracy" (2ed, Palgrave, 2007). Interview with Rainer Forst in "Der Spiegel"
SPIEGEL: Dann wäre die Frage der Gerechtigkeit auch immer eine Frage der Macht? Forst: In der Tat. Die Willkür ist eine Art der politischen oder sozialen Herrschaft ohne ausreichende Rechtfertigung. Unter ungerechten sozialen und politischen Verhältnissen verstehen wir solche Verhältnisse, in denen Einzelne oder Gruppen über andere herrschen oder ihnen gegenüber Vorteile haben, für die es keinen guten Grund gibt, der denen genannt werden könnte, die beherrscht werden oder die Nachteile haben. SPIEGEL: Verschiebt das die Frage nicht bloß von der Gerechtigkeit zur Rechtfertigung? Wie ist denn die angemessene Rechtfertigung zu finden? SPIEGEL: Kann es nicht doch autoritäre Herrschaftssysteme geben, die um Gerechtigkeit besorgt sind, vielleicht auch rechtsstaatliche Grundsätze respektieren? Forst: Denen würde ich immer noch ein großes Potential der Willkür unterstellen. Richtig ist, dass autoritäre, nichtdemokratische Systeme, denken wir an China, große Fortschritte bei der Verbesserung des Lebensstandards vieler ihrer Bürger erreichen können. Aber macht das diese Regime gerechter? Oder wenn ein wohlmeinender Diktator beschließt, seinen Untertanen ein angenehmeres Leben zu bescheren, weil er über große Öl-Einnahmen verfügt, aber die Betroffenen nicht mitbestimmen können, wie das geschieht, würden wir dann sagen, das ist eine gerechte Gesellschaft? Rainer Forst is Professor of Political Theory and Philosophy at Goethe University in Frankfurt, and director of the research cluster on the “Formation of Normative Orders.” He is the author of "Contexts of Justice" (California University Press, 2002), "The Right to Justification. Elements of a Constructivist Theory of Justice" (Columbia University Press, 2011), and "Toleration in Conflict" (Cambridge University Press, 2013). Later this year a selection of his essays is coming out on Polity Press: "Justification and Critique: Towards a Critical Theory of Politics". See one of my previous posts on Rainer Forst here. Review of "Property-Owning Democracy: Rawls and Beyond"
Paul Weithman is Professor of Philosophy at University of Notre Dame. He is the author of "Why Political Liberalism: On John Rawls's Political Turn" (Oxford University Press, 2011). See my previous post on "Property-Owning Democracy" here. Paper on "The Practicality of Political Philosophy"
"The Practicality of Political Philosophy"
[APSA 2013 Annual Meeting Paper. Draft of a paper forthcoming in Social Philosophy and Policy]. Must principles of justice be practical? Some political philosophers, the “implementers,” say yes. Others, the “idealists,” say no. Despite this disagreement, the implementers and idealists tend to agree that what it means for principles to be practical is that they are successfully implementable with fairly predictable results. In this paper I argue that both sides in this dispute are mistaken, each guilty of epistemic overconfidence. By accepting the demand that principles of justice be implementable, the implementers have too much confidence in our ability to determine, in advance, the limits of what is practically possible. By rejecting the idea that principles of justice need to be implementable, the idealists have too much confidence in our ability to determine, in advance, what is normatively desirable. I argue that we should adopt an alternative conception of practicality, one which speaks to the core concerns of both implementers and idealists, reconceives the roles of ideal and non-ideal theory, recognizes our epistemic limitations, and identifies experimentation as a methodological approach for addressing these limitations. Justin Weinberg is Assistant Professor of Philosophy at the University of South Carolina. The Royal Netherlands Academy of Arts and Sciences (KNAW) is hosting a symposium with Jürgen Habermas on "The Future of Democracy" in Amsterdam, November 5. The symposium is organised on the occasion of the Erasmus Prize 2013 that will be awarded to Habermas on November 6. Registration is required. More information here [pdf]. 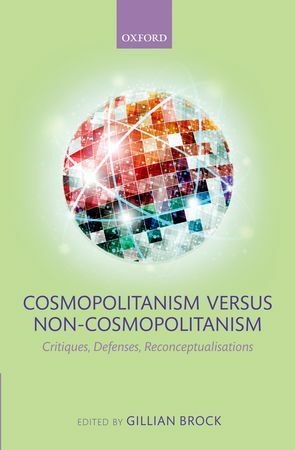 New Book: "Cosmopolitanism versus Non-Cosmopolitanism"
The debate between cosmopolitans and non-cosmopolitans flourishes. Contributors continue to disagree over at least fourteen core issues analyzed in this work, including these questions: What is distinctive about a cosmopolitan approach to matters of justice? What does the commitment to the ideal of moral equality entail for global justice? Does membership in associations, especially national ones, matter to our duties to one another in the global context? Does the global economic order violate the rights of the poor or harm their interests in ways that require reform or redress? What is it to be a good "world citizen" and is this in conflict with local duties and being a good citizen of a state? To what extent are cosmopolitan and special duties reconcilable? Do cosmopolitan or non-cosmopolitan theories provide a better account of our obligations or a more useful framework for mediating the interests of compatriots and non-compatriots? Gillian Brock is Associate Professor of Philosophy at the University of Auckland in New Zealand. She is the author of "Global Justice: A Cosmopolitan Account" (Oxford University Press, 2009). Essay by Habermas in "Der Spiegel"
"Wir kennen die Antwort von Angela Merkel – tranquillistisches Herumwursteln. Ihrer öffentlichen Person scheint jeder normative Kern zu fehlen. Seit dem Ausbruch der Griechenlandkrise im Mai 2010 und der dann doch verlorenen Landtagswahl in Nordrhein-Westfalen ordnet sie jeden ihrer überlegten Schritte dem Opportunismus der Machterhaltung unter. Die clevere Kanzlerin laviert sich seitdem mit klarem Verstand, aber ohne erkennbare Grundsätze durch und entzieht der Bundestagswahl zum zweiten Mal jedes kontroverse Thema, ganz zu schweigen von der sorgfältig abgeschotteten Europapolitik. Sie kann die Agenda bestimmen, denn die Opposition müsste, wenn sie mit dem affektiv besetzten Europathema vorpreschte, befürchten, mit der Keule der „Schuldenunion“ erschlagen zu werden. Und zwar von den Leuten, die nur das Gleiche sagen könnten, wenn sie überhaupt etwas sagen würden." "Europa befindet sich in einem Notstand, und die politische Macht hat, wer über die Zulassung von Themen zur Öffentlichkeit entscheidet. Deutschland tanzt nicht, es döst auf dem Vulkan. Versagende Eliten? Jedes demokratische Land hat die Politiker, die es verdient. Und von gewählten Politikern ein Verhalten jenseits der Routine zu erwarten hat etwas Apartes. Ich bin froh, seit 1945 in einem Lande zu leben, das keine Helden nötig hat. Ich glaube auch nicht an den Satz, dass Personen Geschichte machen, jedenfalls nicht im Allgemeinen. Ich stelle nur fest, dass es außerordentliche Situationen gibt, in denen die Wahrnehmungsfähigkeit und die Phantasie, der Mut und die Verantwortungsbereitschaft des handelnden Personals für den Fortgang der Dinge einen Unterschied machen." An abridged version of the essay is published in the Italian newspaper "La Repubblica", August 4, 2013. English translation: "Merkel's European Failure: Germany Dozes on a Volcano". English translation: "Habits of the Heart"
"Das hohe Alter ist bei manchen Geistes- und Sozialwissenschaftlern eine Zeit ungebrochener Produktivität. Im Vertrauen darauf entwarf Robert N. Bellah, der führende Religionssoziologe der letzten Jahrzehnte und einer der einfluss-reichsten öffentlichen Intellektuellen der USA, zu Beginn seines Ruhestands das Projekt einer Globalgeschichte der Religion von ihren Anfängen bis zur Gegenwart. Religiös neutral ist Bellahs Globalgeschichte der Religion nicht. „Nothing is ever lost“ ist ihr Leitmotiv: Ritual und Mythos sind auch nach der Entstehung von theoretischer Rationalität und moralischem Universalismus nicht passé. Er vertrat sein Christentum in der Spannung zwischen Prophetischem und Sakramentalem. Das späte große Buch verwirklicht nur die Hälfte des ursprünglichen Plans; die Schwelle zur Entstehung von Christentum und Islam war noch gar nicht erreicht. Die Fortsetzung sollte ein großer Essay werden zur Entstehung der Moderne, aber gerade nicht ein weiteres Werk zum „Aufstieg des Westens“, sondern derart, dass China soziologisch und kulturell gleichberechtigt behandelt würde. Die riskante Herzoperation, zu der Robert Bellah sich entschlossen hatte, erlebte er mehr als störende Unterbrechung der Arbeit, weniger als Quelle von Todesfurcht. Am Mittwoch dieser Woche ist er ihr im Alter von 86 Jahren erlegen. Hans Joas is the author of "The Sacredness of the Person: A New Genealogy of Human Rights" (Georgetown University Press, 2013) [German: "Die Sakralität der Person" (Suhrkamp, 2011)] and co-editor (with Robert Bellah) of "Axial Age and Its Consequences" (Harvard University Press, 2012). See Hans Joas's interview with Robert Bellah on his book on religion in human evolution in "The Hedgehog Review" (2012). See also my links to obituaries and appreciations of Bellah here. Robert Bellah died July 31 of complications related to heart surgery. He was 86. * Web page dedicated to the work of Robert Bellah. Also see my post on Robert Bellah's book "Religion in Human Evolution" (Harvard University Press, 2011). And listen to an interview with Robert Bellah on his book and his evolutionary perspective here (60 minutes). Review of Habermas's new book in "Die Zeit"
"Sechzig Jahre am Nerv der Zeit"
"Ein 24-jähriger Student empört sich über einen Satz in einem Buch des berühmtesten Philosophen der Welt, den er eigentlich verehrt, schickt daraufhin einen kritischen Text an die Zeitung – und ist damit über Nacht in aller Munde. Das geschah vor unglaublichen sechzig Jahren, als Jurgen Habermas in der FAZ den Artikel Mit Heidegger gegen Heidegger denken veröffentlichte. Es war die Geburtsstunde eines engagierten Intellektuellen, denn der junge Mann attackierte Heideggers ausbleibende Auseinandersetzung mit dessen Rolle im Nationalsozialismus." "Jetzt also legt der 84-jährige Habermas den, wie er schreibt, "voraussichtlich letzten Band" seiner Kleinen politischen Schriften vor, in denen er seit 1980 Reden und Aufsätze aus meist tagesaktuellem Anlass sammelt. Wer den Band liest, der "das Dutzend vollmacht", wie es der Autor flapsig nennt, der kommt einmal mehr aus dem ehrfurchtsvoll-neidischen Staunen nicht heraus: Woher nimmt der Mann nur diese Energie? Rastlos betreibt er seit sechs Jahrzehnten seine "Praxis öffentlicher Belästigung" (Habermas), von nicht nachlassender Neugier, Sorge und Fähigkeit zur Empörung getrieben – und zwar neben seiner hauptsächlichen Praxis als Philosoph, in der er es auch noch schaffte, die allereinflussreichsten Werke hervorzubringen. So frisch und juvenil: was für eine One-Man-Performance im Dienste der res publica!"